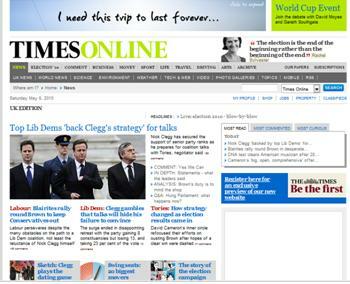 Timesonline.co.uk, website of UK newspaper The Times, aims to provide breaking news and stories as and when they happen. It must include articles for a variety of interests and cater for those who are browsing in a hurry as well as those who wish for a more thorough read. Times Online can be found easily when the user searches for the specific website on top search engines Google, Yahoo and Ask Jeeves. When ‘Times Online’ or ‘The Times’ are entered into these search engines the website fills the whole first page of results. However, when you search ‘UK News’ on Google it is only ranked 6th following the likes of The BBC, The Guardian and Sky News. All in all it is easy to locate on the search engines and automatic redirection to the website for those users who have typed the incorrect URL also makes finding the website easier. For instance, many customers of The Times may not realise the website has a different name so users who type thetimes.co.uk are automatically transferred to timesonline.co.uk. However, Beaver County Times website has the same URL but ending in .com rather than .co.uk which could cause some confusion. Times Online loads information fairly fast considering the vast amount of content on each page and the hyperlinks take you to the correct information promptly. However, video and audio streaming can take a while to load and sometimes freeze which may be frustrating for the user. From first impressions the site is bursting with up to date news showing the vast amount of content that Times Online has. It has a diverse range of stories under categories such as ‘news’, ‘sport’, ‘entertainment’ etc ensuring there is something for everyone. On the home page is a summary of many different articles giving only the main facts for those users who are just looking on the site briefly. The headline is hyperlinked to a page where the full article can be read for those wishing to take more time over the site and a more in-depth read. 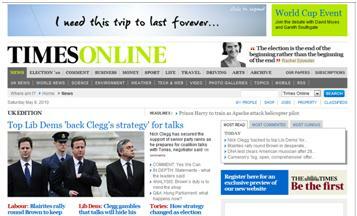 The homepage does appear cluttered though and includes too much information for the user to browse through easily. It may be more satisfying to the user just to show the top articles and interest points on the home page and then include navigation buttons to the other articles. However, the actual design of the site is fairly simple with the colour scheme being just black, blue and green on a white background matching the colour scheme of The Times newspaper. The headlines of articles and most important information are blue which stand out against the white and attract the eye to them. The photos next to each of the articles also attract attention as users will see a photo that intrigues them and want to read more. The opening paragraph stating the main facts are written underneath the headlines in a simple black font which means the user can read the summary effortlessly. The pages which include the full article are much less cluttered. The articles are not too long and are written in the conventional inverted pyramid news style allowing users who are in a rush to learn the main facts straight away. The navigation bar that runs across the top of the website on every page is in hierarchical order of importance with ‘News’ being the first option, ‘Art/Entertainment’ further down and ‘Subscriptions’ last. These options are then broken up into further headings for easy navigation. For users who do not have the time or wish to browse the entire site, there is a search box. Underneath the navigation bar is a ‘where am I’ bar so the user can clearly see what page they are currently visiting and track where they have been. This makes it easy for them to navigate the page again at a later time. If the user wishes to go back to the home page at any time then they just have to select the large Times Online logo which is at the top of every page. For those who are just visiting the site without a particular article in mind there is a box at the top of the screen which states the ‘most read’ articles. Democracy is encouraged as users are free to express their views on the site by commenting under each of the articles and giving their opinions on current news topics and debates. Involving users can also add to the amount of content on the site and help creators to gain an understanding of what users are most interested in reading. Users are also encouraged to follow the site through the RSS feed for constant news bulletins without having to enter the website. Unexpectedly, no polls could be found by browsing the site or searching ‘polls’ which would be another form of user participation and a way to discover the majority opinion. UGC also feature on the website through the ‘letters’ and ‘comment’ pages.